I found this park bench, sitting outside a computer store, in Sheridan, Arkansas. 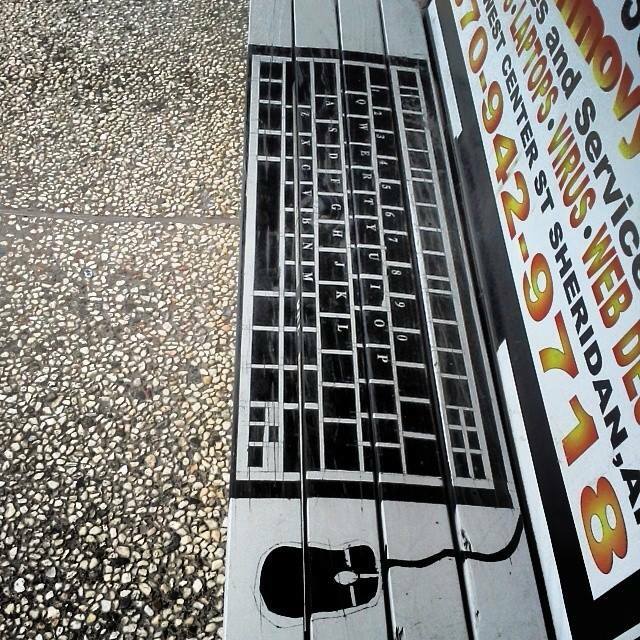 They painted it to look like a computer as a way to advertise their business. I thought it was neat and took a picture of it. This entry was posted in Blog, Photo Challenge, Travel and tagged Arkansas, artist, artwork, computer stores, computers, country stores, country towns, letters, park benches, photo-challenge, photography, Sheridan, Sheridan Arkansas, small stores, small town stores, small towns, stores, travel, Weekly Photo Challenge on April 29, 2014 by JenniferNAdams. I grew up thumbing through the Saturday Evening Post, as I’m sure some of you have as well. My grandma still has a few old copies put away on a bookshelf. The cover is usually what everyone remembers; the beautiful artwork done by the gifted artist Norman Rockwell. This semester in college I’m having to take an Intro into Visual Arts class. It’s one of those class I have to take in order to receive my Associates degree. Though I have taken a few art classes in high school and middle school, I have never really taken a class to study about actual art pieces and their artist. I have always had an appreciation for art. I do enjoy the beauty and the craft, but have never serious stared at a painting and truly see what the artist is trying to say in his work. This class is actually teaching me a few things about art and the artist behind their work. My instructor would show slides of certain pieces and talk about the artist, then talk about the artwork he’s showing on his slide. We’ve looked at quite a few Norman Rockwell paintings, that I’ve found a new likeness for the artist and his work that I didn’t have before. Sure, I have respect for Rockwell and love his work. He’s truly gifted. But, after really looking at certain pieces, I can actually see that his work is actually telling a story. There’s symbology in his work, as there is in all artist work, you just have to look for it and I’ve never really done that. Since Rockwell is a Christian and a family, who also loves his country, he’ll always show one, if not all of those traits in his work. 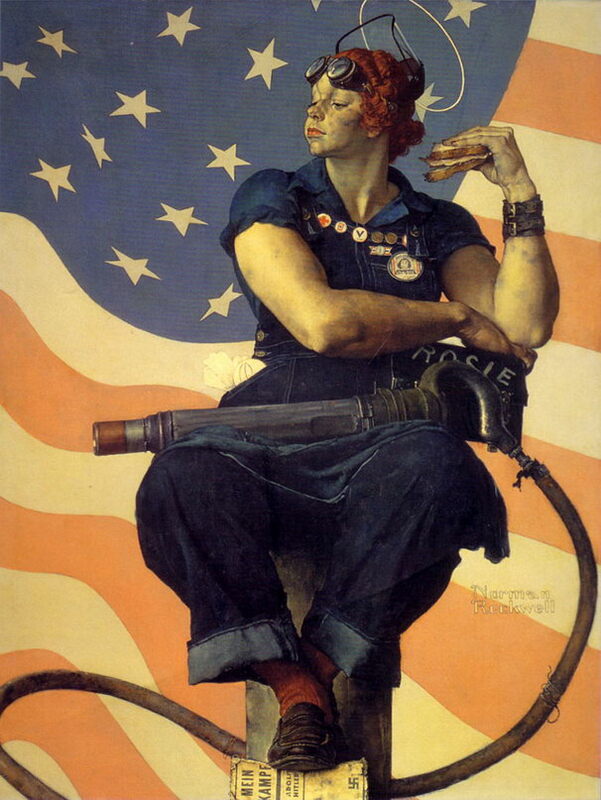 One of the Rockwell pieces is that of Rosie the Riveter. It’s actually one of my favorites as it represents a time in history where women were allowed to show that they too can do things other than teach and sew and keep house. The year was 1943, WWII had started and most of the men went off to war. This left the women back at home to take up jobs usually done by men. Posters were made up, showing the women that it was okay to do a man’s job, who else was going to do it? Rockwell’s painting shows patriotism. It shows that women can do a man’s job and still hold their femininity. He also placed a halo above Rosie’s head, showing that he appreciates what they did for their country. With her feet placed on top of a book by Hitler shows that they aren’t scared of him and that they can defeat him. Those are just a few symbols in the painting that we talked about. I’ve actually learned how to really look at a painting. Not just by staring at it and enjoying the beauty of it, but by really looking at some of the things that the artist drew or painted. What did he/she mean by putting this or that in the painting? Those certain items explain the actual meaning behind the piece of work and the reason why the artist painted it, or drew it. This entry was posted in Blog and tagged art, art appreciation, artist, college, college classes, college student, Norman Rockwell, painters, painting, Rosie the Riveter, World War II, WWII on January 28, 2014 by JenniferNAdams.